In combination with our cable tie, the NORMA® HVAC Clip makes it very easy to attach externally corrugated spiral hoses in HVAC (heating, ventilation, air conditioning) installations. It is a very lightweight, flexible and economical alternative to metal bridge clamps. The patented shape and functionality of the NORMA® HVAC Clip makes it possible to span the crossing of the hose spiral. Thanks to this special geometry, the cable tie can grip the hose around its whole perimeter so that it is fixed safely. 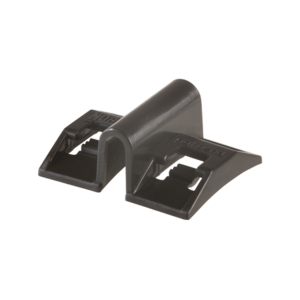 The shapes of our HVAC Clip and our cable ties match perfectly, forming a reliable system. This system works independently of the direction of the spiral on the hose. The HVAC Clip can be used for both right-handed and left-handed spiral hoses.